This is one of my favourite go-to meals when the weather turns. Depending how busy my day is set to be, I can prepare it early on in the morning, then back it in time for the evening meal. 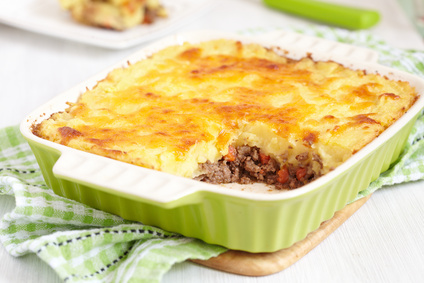 It can also be prepared and layered in a slow cooker, then set to cook on slow throughout the day – making it perfect if you’re planning on going out for the day but wanting something hot and hearty to come home to. Peel and chop potatoes into chunks. Place in a pan of boiling, salted water whilst you prepare the meat. Drain when potatoes are tender. In the meantime, warm oil in a frying pan. Finely chop onions and carrots and soften in oil for five minutes. Add mince, salt and pepper, and cook until browned all over. While meat is browning prepare the stock. Add the plain flour and whisk until stock is thickened. When meat has browned pour the stock over, add the peas and allow to simmer for five minutes. Place the meat into the base of a large, deep-sided oven-proof dish. Drain the potatoes and return to the pan with milk and butter. Mash, then layer on top of the meat. Sprinkle grated cheese over the top. Bake in oven for 35-45 minutes until golden and bubbling. Check out more recipes from main courses to cakes and desserts here. Making this today! I m sure my kids will love it especially my boys!